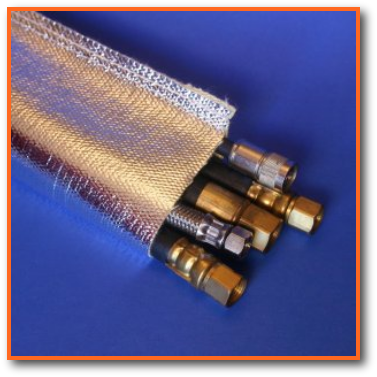 This aluminum foil coated fiberglass high temperature, heat resistant and radiant heat reflective sleeve can be used to protect industrial wires, cables, hoses (hydraulics), piping and tubing from radiant heat sources such as glowing steel slab, liquid metal pour stream, infrared heaters and other similar sources. First, a layer of highly polished aluminum foil is calendared under high pressure and with an adhesive onto a high temperature fiberglass base fabric. That fabric is slit into an tape, which is then sewn into a sleeve. The fabric can also be fabricated into a sleeve with Velcro hook and loop closure, to result in a removable sleeve. Available in sizes from 1/2" through 12" ID. Larger sizes are available under special order. Two weights of fabric are used to make these sleeves: a 21oz and a 35oz. The 21oz material has better aluminum adhesion for applications requiring some flexing. A four layer aluminum coated fabric is available. This fabric is more robust, but quite stiffer than a single layer aluminum coated fabric. Generally, aluminum foil coated fiberglass is suitable for applications involving static hoses, cables and wires. For installation where continuous movement or flexing is involved, an aluminum coated film fiberglass is more suitable. Also available is a solid annular stainless steel sleeve. The reduced continuous temperature limit of this material is due to the adhesive used to help bond the aluminum foil layer to the fabric. 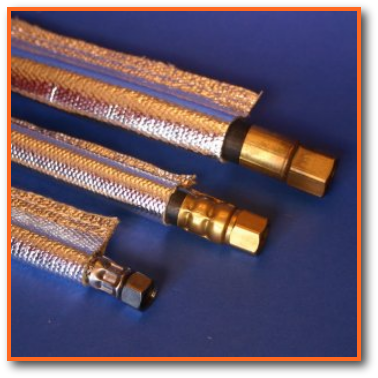 Notwithstanding the temperature limit, intense radiant heat can be reflected while still under the continuous temperature limit.